The video begins with Yoni himself reciting the opening verses of the song. However, as he sings, the lyrics are shown bouncing out of his mouth, word by word. In a sense, he is regurgitating the subtitles for his own song, and also makes gestures to go along with the lines. For example, when he sings the word “two,” he pairs the utterance with a peace sign, or when he mentions the word “film,” he makes a circular motion with his hands in order to emulate the spinning of a film reel. This may seem like an easy pattern to follow for the rest of the song, but Yoni has a few tricks up his sleeve. 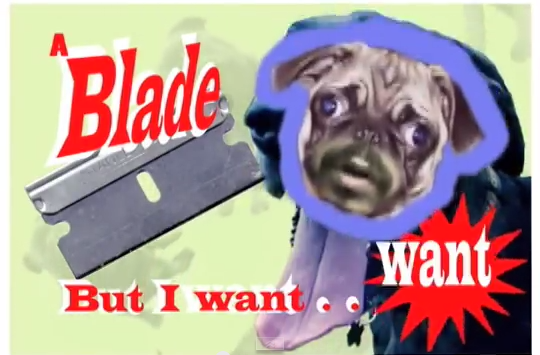 Just when viewers think they have gotten the gist of the music video, the steady flow of visual lyrics emerging from his mouth transforms from words and letters into random objects such as a pair of scissors, a handgun, and even the head of a dog. The video’s kinetic typography is interrupted. It is like someone changed the font from Times New Roman to Windings mid-song, apropos of the onomatopoeic nature of the concurrent “verse” (“Ding-di-ding-di-ding-ding boom boom boulder”), and goes hand-in-hand with the band’s absurdist style. Self-improvement is the central theme of “Rubber Traits,” as Yoni professes his desire to be gentler, sweeter; of wanting “a patch of blue sky to follow (him).” He preaches the benefits of sobriety (coffee instead of alcohol), of keeping a clear mind (“unscratched lenses of a brand new prescription”), and of keeping busy (“drawing days… and doing, doing, doing”). Of course, it is not all sunshine and unicorns. He suggests that although he has become a forward-looking individual, suicidal thoughts are hard to avoid and he mentions, quite poetically, that he is “always working on a suicide note.” The language is inherently cryptic, often leading the viewer to do a double take to make sure one understood the lyrics correctly. The audio can only do so much as an aesthetic vessel. When “Rubber Traits” becomes a convoluted mess of metaphors as it nears its first chorus, its correspondent literature appears on-screen to aid the listener, at which point reading loses the static and becomes a visual exercise. This is where music and digital poetry collide. Expanding on the use of canines in the video, Yoni is adopting the careless and tender personality of domesticated dogs as a personal North, a quality that these pets possess and that people who suffer from anxiety or depression should aspire to attain. The video reinforces this interpretation as Yoni’s mouth is superimposed on dogs’ faces, making it seem as if the dogs are the ones displaying a positive attitude toward the topics of despair and self-harm and rendering the matter — if I may make the remark without causing offense — simultaneously cute and creepy. The narrative fluctuates between the mundane and the truly sad, yet Yoni keeps a optimistic outlook on the value of life while chilling with his dogs and sharing in their good vibes. He makes one last observation, which functions as the argument to his thesis statement in the chorus, when he contemplates the short life and unceremonious death of a common housefly. 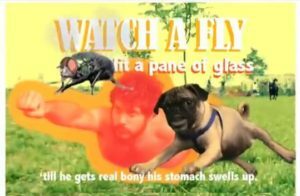 He contrasts the fly’s self-destruction with his own potential suicide, eventually settling on the realization: “I don’t want to / when I feel I could’ve gone longer.” And he has.